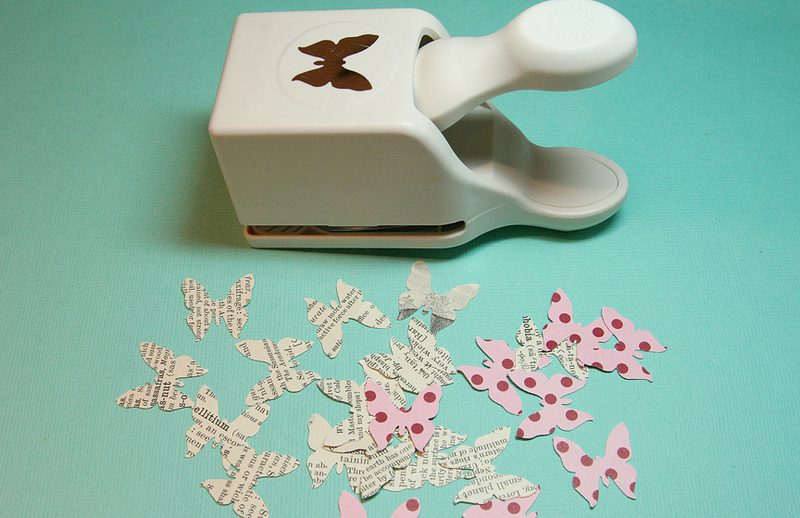 Today I've been working on a little something for my daughter Kati's 6th birthday next week - some butterfly birthday invitations. Awhile back when I made these lollipop bouquets, Kati decided she wanted a butterfly party for her 6th birthday, and she wants to make that craft with her friends at the party. We are actually going to have it at the park, but hopefully we can fit in a craft. I think I'm going to have things stamped out ahead of time and the lollipop bouquet bases already made and all they will have to do is assemble the bouquet - stick the lollipops in the middle of the stamped images and insert into the foam! 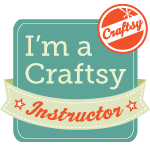 (See link above for directions for that craft). I will probably change the colors of the lollipop bouquet stamping to match our invitations and party decor. Anyway...let me tell you a little about my invitations! I started with Papertrey Ink's medium Glassine Bags. I used the sentiment from Blooming Button Bits and stamped it in black StazOn ink across the bag. The bags are somewhat slippery, so I thought StazOn would work the best. It did. But for the flower stems, I didn't really want black. I wanted to add some green, so I used Ripe Avocado ink with the stems from "Blooming Button Bits". It didn't come out perfectly, but that's ok. I used my heat gun to dry the green ink quickly, so I could move on to the next step. I stamped all of the sentiments and stems first to all of the invites. Next, I made the insert for the inside, by printing out the party details onto white paper, then stamping a yellow butterfly over the top from Happy Trails. 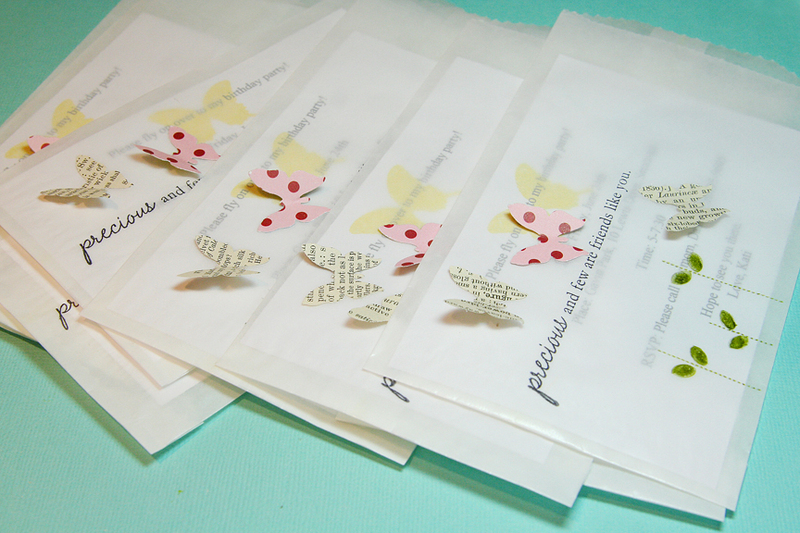 ...then attached the butterflies to the outside of each bag. Then I added ALL of the buttons. This part is the most painful and took the longest! I threaded all of the buttons with white embroidery thread and attached them with a glue dot. To finish my invitations, I folded over the edge of the bags and stapled them closed with a staple and some pretty seam binding. To color the seam binding pink, I sprayed it with Vintage Pink Glimmer Mist by Tattered Angels. I ran out of Vintage Pink, so I ended up spraying the rest of them with Viva Pink. 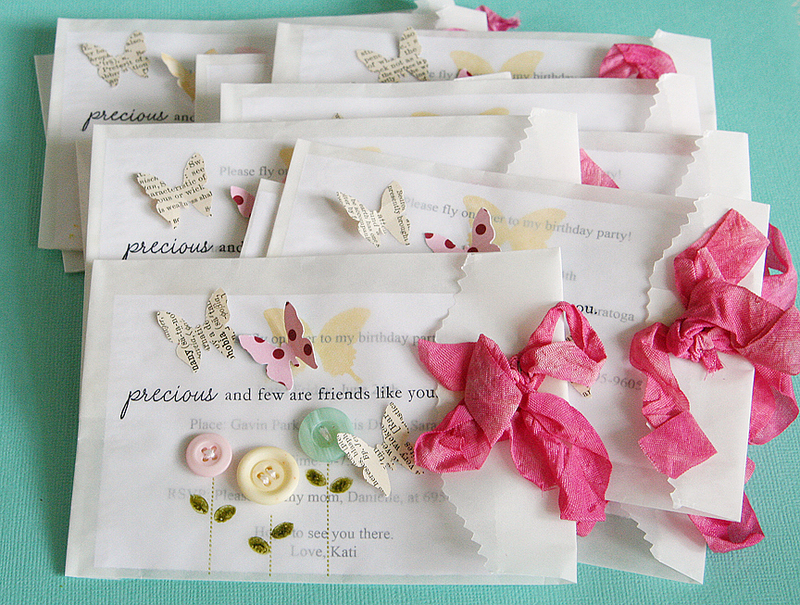 Let them dry or heat them with a heat gun before attaching to your bag. That's not just cute - it's utterly adorable and superduper clever! I love it!! Well, they certainly put a smile on my face! Love them! Absolutely darling!!! Just love them to pieces...thanks for sharing!!! Oh, I love these!! Lovely!! Beautiful invitations Danielle!! Genious! It totaly put a smile on my face! These are gorgeous! 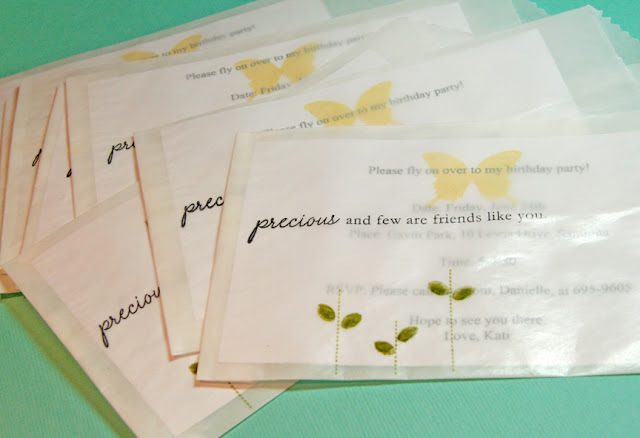 Love your idea for using the envelopes as invitations! 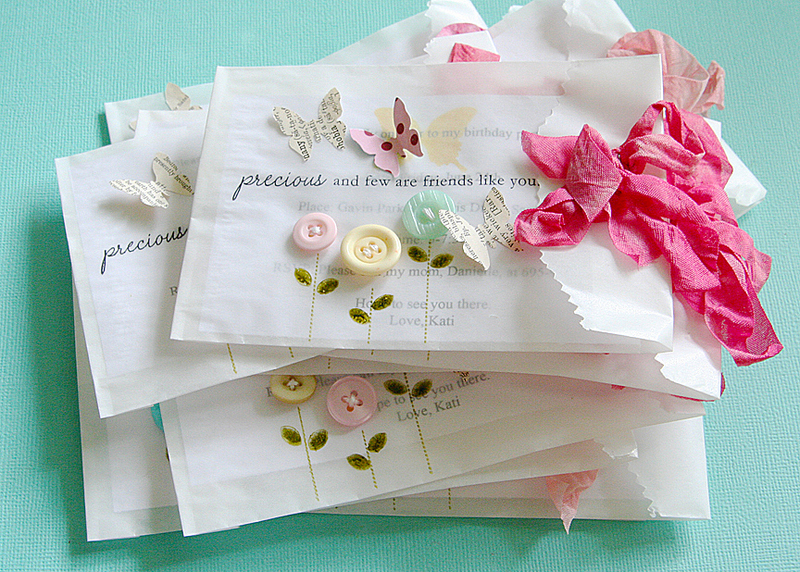 How could anyone throw away anything as pretty as these invites? They are just beautiful! Some people tell me, "Don't you have a life? ", but I don't care because, like you, I enjoy bringing a smile to others. 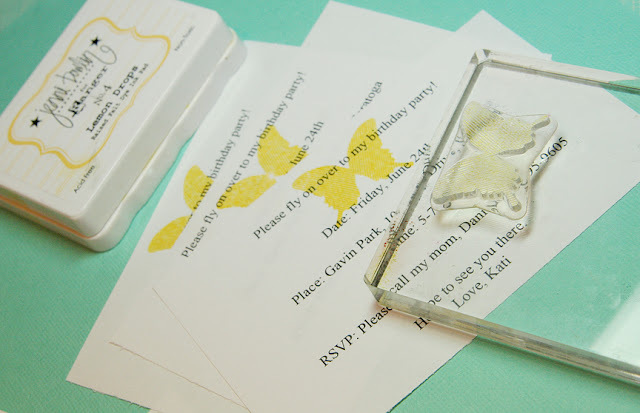 These invitations are absolutely AMAZING! Anyone who would even think to throw them out would be crazy! Truly a piece of art, surely to put a smile on every face,GORGEOUS! You sure put a smile on my face. Those invitations are beautiful and so cheery! I think they would make great packaging for small gifts, too. Those are precious AND beautiful!! 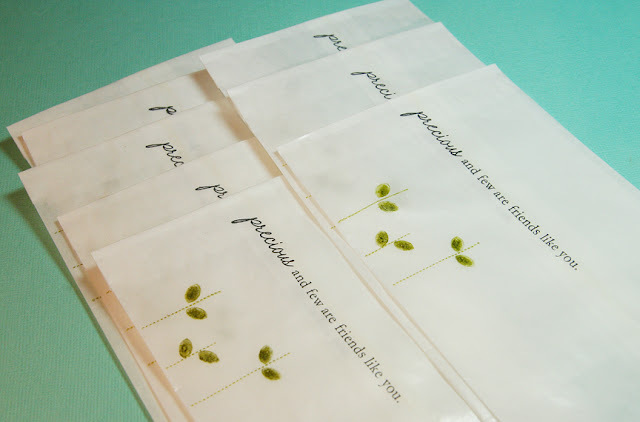 I love the idea of using the glassine bags as the "envelope". This is something my oldest daughter would *love* to do (she's all about "different" for her birthday invites and thank you notes). I'm tucking this away for next January. Love, love it! Oh I am in love. These invites are SO pretty. The leaves and stem look like watercolor - very nice effect from using the ink pad. Love how the yellow butterfly peeks through the envelope. Thanks for the inspiration. Danielle, they are georgeous and I doubt everyone will throw them away. I hope some mothers will save them in their daughters "stash" and enjoy them for years to come! I know I would. You never cease to amaze me with your talent. I love everything you do. A little question however. 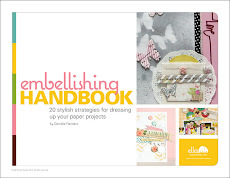 When you spray your seam binding, do you crumple it so that it dries kind of wrinkly? I love that look. Потрясающе красивые, стильные, воздушные как крылышки бабочки приглашения! Just love the invitations; nice job! 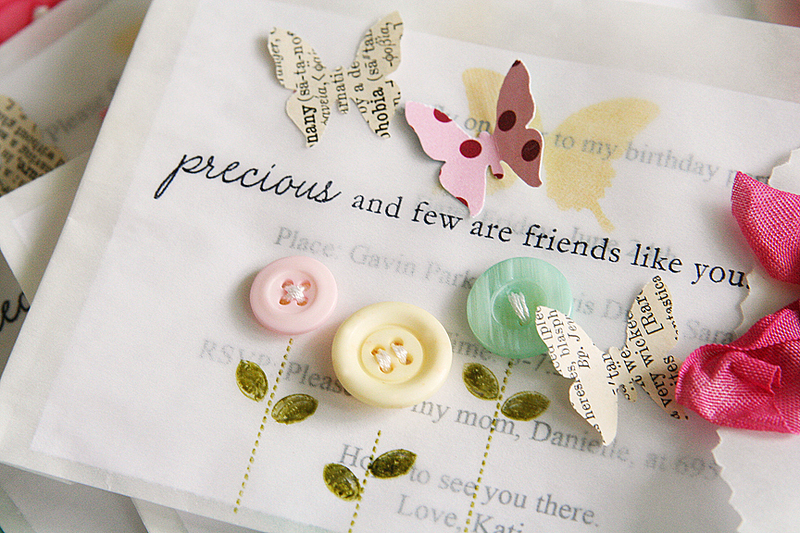 These invitations are simply darling, how pretty and dainty are these gorgeous creations...love them! Just gorgeous! Would love to use this idea down the road somewhere. Thanks for sharing. Such beautiful invites Danielle, really love how you've stamped the glassine bags...fabulous! love the clean invitation cards...pastel colors are lovely too! Just stunning! Wonderful envelopes. Thanks for sharing this heart warming post. These invites are so very sweet!! Would you mind if I design a similar look for girls night out? these are so adorable, and they did put a smile on my face! WOW! What did you do for favors and thank you cards? My husband says the same to me, and I do try and take that into account as my daughter's friends are mosstly under 5, but i take pictures and enjoy the oooo's and ahhhh's! These are so lovely!! I want one! Your daughter is so lucky! These are ah-mazing!!! Every element is a work of art in itself! If i got an invite like this, I'd literally (I mean literally) never throw it away! My friend handmade beautiful invites to her daughter's baby shower... still sitting on my desk & it makes me smile everyday! Things like this really make others happy. I bet they made you so happy to make them too! Nice work & thanks for sharing the entire process!!! I know I'd love to receive one... stunning. These are the most beautiful birthday invitations I have ever seen!!! I would not throw these away! They are beautiful! Wow, those are really cute birthday invitations. The buttons as flowers is a nice touch! Adorable! Je viens d'acheter le dernier numéro de "Esprit Scrapbooking" et j'ai fait une pause sur votre article... j'adore!!! I laughed at your daughter's comment about people just throwing the invitation out. I had a friend who told me that she had finally thrown out a Christmas card from me that I had made for her. She kept it for 20 years because she had liked it that much. You never know how important something might be to someone else. Love the invites and will make some of my own. I would never ever throw away such an invitation! 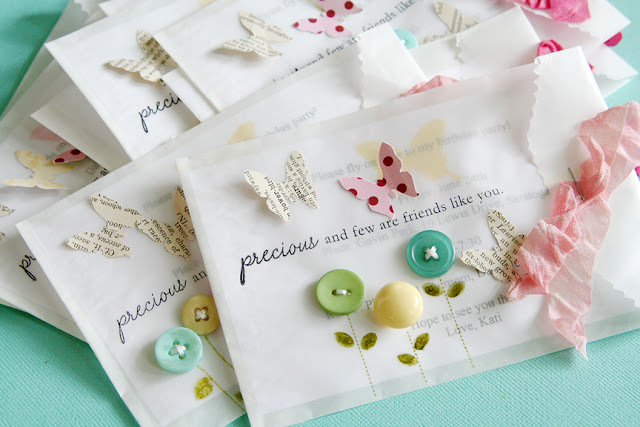 Lovely invitations! WOW! I love love love these adorable little invites! Going to make invitations for one of my daughters' fifth birthday party, and was planning on doing buttons, after seeing this, I will definitely be using the velum to recreate the envelope that you made using the bags. Thank you for the wonderful ideas. Are you interested in making something similar to sell? Those are lovely birthday invitations. I love your creativity. I'm also planning on making my own invite, you have just given me another idea. Thank you for sharing!